Adds a luxury finish to all projects! Ideal for all your wedding requirements from invitations to cake decorating and floral additions! 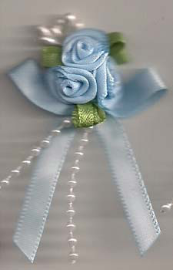 Small Blue Satin Ribbon Roses with soft green satin leaves - Pack 10 / 100.